February 8, 2012 By This post may contain affiliate links. 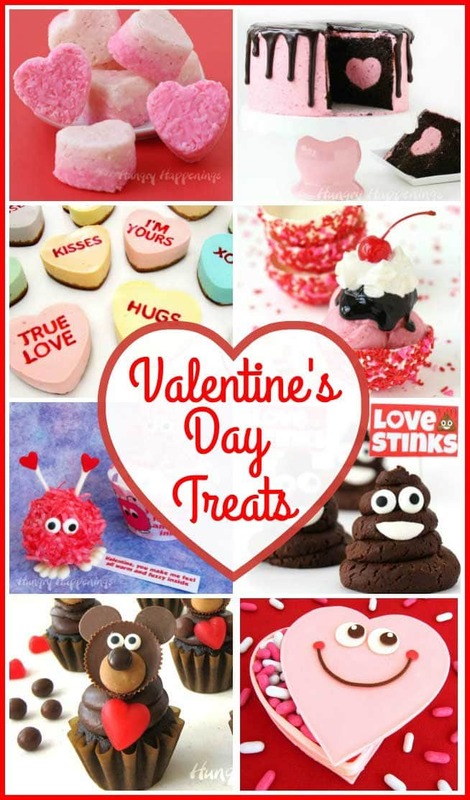 There are other ways of showing love besides giving sweets! 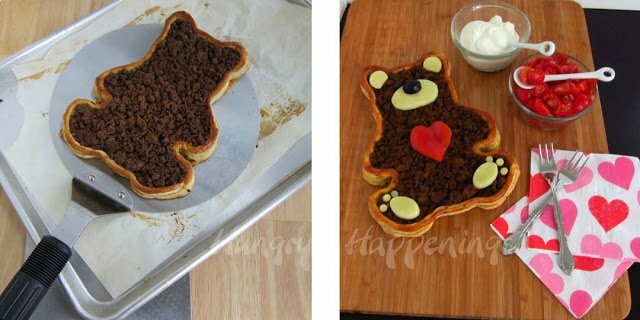 This Teddy Bear Taco Tart is a perfect example of that, make your loved ones a delicious dinner show them what they mean to you. The other day one of my readers made the observation that I am a perfectionist – oh, so true. If you ask my parents they’d tell you that I came out of the womb that way. This recipe post will demonstrate just how much care I take in getting my recipes perfect so that you can replicate them in your own kitchen. This project started out simple enough; I was going to make a recipe I had suggested a few weeks ago, a puff pastry tart decorated to look like a teddy bear, much like the football shaped tart I made for the Super Bowl. I wanted it family friendly and savory, so I planned to make a simple taco meat and cheese filled tart. O.K. so let’s try this again. I thawed a frozen sheet of puff pastry, it unfolded nicely. I set it on a parchment paper lined baking sheet, so I wouldn’t have to pick it up and move it once cut. Then I set my bear template on top and cut out around it. I tried to lift the template, but it was stuck. I slowly peeled it off the bear, losing some dough, but it looked alright. The long strips I cut to make the rim around the bear, however, were so stuck to the parchment paper that they tore when I tried to move them. I couldn’t bake this puff pastry bear with all of that excess dough stuck to the parchment as it would have burned, setting off my overly sensitive smoke alarm, so I had to move the bear to a new piece of parchment after all. I don’t know how, but it held it’s shape pretty well during the move. Unfortunately, I didn’t have any strips to make the rim. I decided to just dock the inner dough with a fork leaving a 1/2″ border around the bear, slid it into the oven and crossed my fingers hoping the edges would rise up higher than the middle. Nope, didn’t work. It had a great teddy bear shape but without a rim, the tart wouldn’t keep all that taco meat in place. At this point, I was a bit frustrated and tired and just wanted to go back to bed, but I couldn’t let this crust go to waste and decided to turn it into a dessert for my hubby. I slathered the crust with some Nutella and was going to call it a day, but it looked so good that I ended up adding marshmallow ears, paws and a snout and a chocolate covered raisin nose, candy eyes, and a gumdrop heart. Wow, it was so cute. I quickly snapped a few pictures in my now very dark room, gave it to my husband, and went up to bed. Sometimes good things come out of bad, and although this tart was adorable, it just wasn’t exactly what I wanted. It would have to wait another day. You know the saying the third time is the charm? Well, in this case it was true. 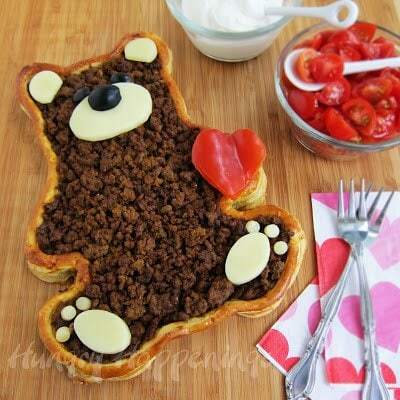 This afternoon everything went right in my kitchen; I floured my parchment paper and the top of the puff pastry so nothing stuck, I cut out a perfect bear, added a nice rim, baked it to a beautiful golden brown and topped it with cheese and taco meat. I decorated it with cheese, olives, and a red pepper heart. I snapped some pictures and sat and enjoyed some of this yummy tart topped with some tomatoes and sour cream. This teddy bear tart is exactly what I envisioned when I began this process and even though I hit a few bumps along the way, I ended up with a perfectly cute and tasty tart that I think your family will love. Now that I’ve worked out all of the details, you should have no problem creating your own Teddy Bear Tart at home. Brush egg wash, milk, or cream all over the teddy bear. Lay the strips along the edge of the teddy bear pinching the seams together where necessary. Cut off any excess dough. 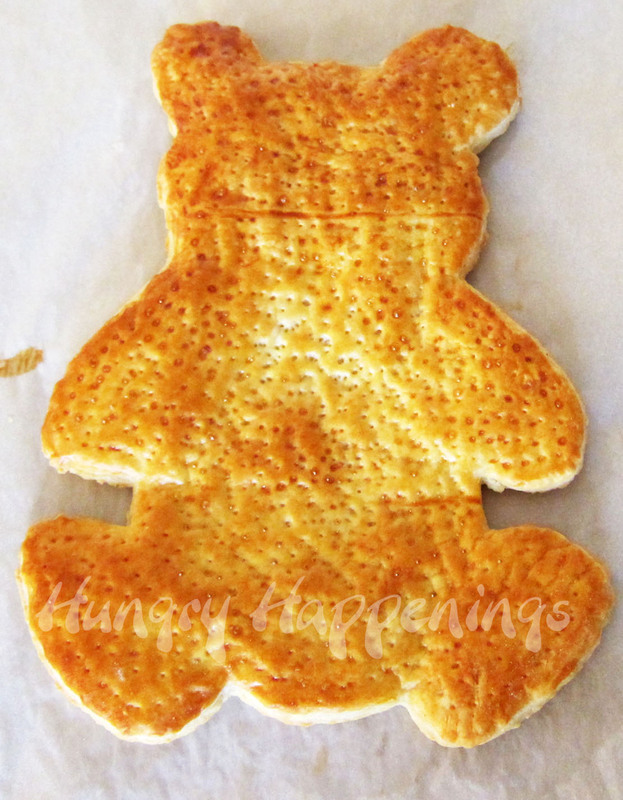 Lift up the sheet of parchment paper and set the teddy bear on the baking sheet. Use a fork to prick holes all over the dough not including the border. Refrigerate for 30 minutes. Preheat oven to 400 degrees while dough is chilling. Bake dough for 15-18 minutes until deep golden brown. 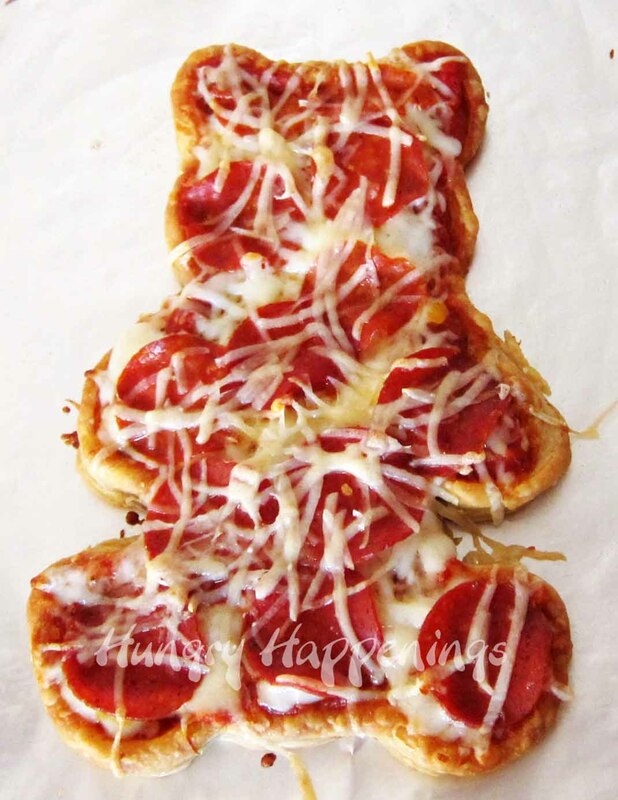 While the teddy bear tart crust is baking, create the decorations. Cut one large oval from a slice of cheese to be the bear’s snout and two small ovals for the paws and six tiny circles for the toes (I used a knife, a small oval cookie cutter, and a #12 round pastry tip.) Cut two circles then cut a third off of each for the ears. Cut the black olives in half lengthwise and set one, flat side down, on the large cheese oval to make a nose. Cut two small ovals out of the other olives to make eyes. 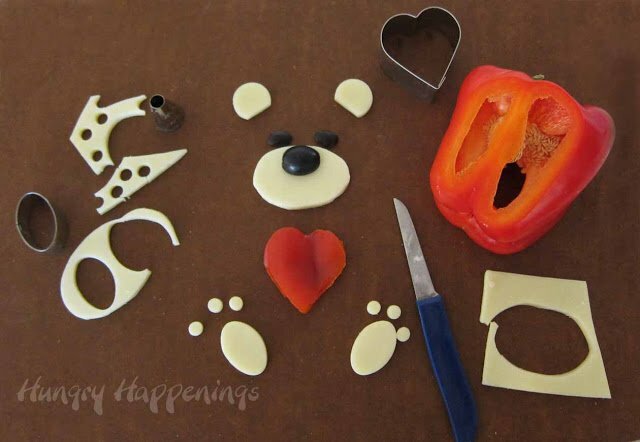 Cut one slice of red pepper or tomato into a heart shape using a cookie cutter or knife. Remove baked pastry crust from oven and carefully top with cheese then taco meat. Bake for an additional 8-10 minutes until heated through. Note: I know it looks like I added feta cheese, but that is actually Monterey Jack cheese. I just crumbled up the scraps after making my decorations (pictured above) then added some cheddar to go along with it. Immediately remove from oven and move onto a serving platter or cutting board using a large spatula, an oven spatula, or pizza peel. Add the eyes, ears, paws, and snout. Serve hot along with sour cream, tomatoes, and if you like, jalapenos and guacamole.Update: I just had to share this picture sent to me by Jo and Sue. They made boy and girl bears. So cute!!! Supplies I used to create this recipe are available on Amazon.com. I love how honest you are about making your wonderfull foods, and having problems on your own. That way I could imagine to try It myself, even if it won't come out perfect the first time. Keep on going. I love your blog because it gives me so much inspiration. Thanks you Jan. I don't want people to feel intimidated by my recipes and feel it is important for you to know that there are times when it takes me a few tries to get a recipe just right. I hope that all my work makes it easier for my readers to make it right the first time without a great deal of effort so you can have fun in the kitchen. Thanks:) The best thing about this idea is that you can cut this pastry into any shape your heart desires. I look forward to seeing how this idea inspired you two. I just love what you have done with my recipes so far. You inspire me too! Thanks for the invite Heather. I linked up this recipe. It would be really amazing to hear people say "this recipe was made famous by…" and hear my name attached. I love the concept of your blog. Thanks for the invite. I linked up this recipe. Sorry you were sick! This looks adorable and I love the nutella one, too! Thanks Michelle, I'm feeling 100% better now. This is just so incredibly cute! I am loving your blog! Thanks Liz, I'm happy to hear it. Wow, that's so great. I love all the variations you made with your "failures" (which looked pretty good to me! ), especially the Nutella one, yum. I could eat this whole Taco Teddy myself! Thanks Dorothy, We did indeed enjoy eating all of the goofs, especially the Nutella one. My husband and I shared the taco tart, but he said he could have eaten the whole thing too! Hi Jill, I hope your first linky party is going well. I linked up this and a few others. Happy Valentine's Day. That is so adorable and it's actually something I think I could make. Oh the possibilities of shapes! Thanks for linking up at Thematic Thursday. I know, I think there are endless possibilities with this idea and I'm sure I'll make some more of them in the future. Thanks Rina. Have fun making them for your son! I love that Nutella bear. He is so cute! Thanks Tiffany, it was really tasty too. My husband ate most of it, but I was able to sneak a few bites. My husband doesn't like cute food. Sigh…..
Oh, my! I guess you make all of your amazingly adorable food for you and your son. I'll have to admit that my husband also thinks food should look like, well, what food is meant to look like, but he does sometimes get a kick out of my creations. He especially likes what I make for our Halloween parties and has accepted the fact that he'll dine on themed cuisine at least twice a week. Wow!! That is amazing, you are so creative!! Thanks Wendy, I'm glad you like them. 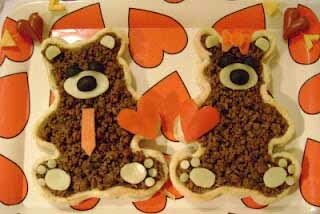 I am so in love with your pair of teddy bear taco tarts that I not only added your picture in my reader's gallery, but I also added it to my post so that everyone looking at the recipe would see what a wonderful idea you had. You ladies are geniuses!!!! Thanks Beth. Oh, I wish every meal I prepared were this fun, but I spend so much time working on recipes for my blog, many of which are sweets, that by the time I need to make dinner, I'm tired and I just chop up veggies for a salad.Fortunately my husband doesn't mind, especially if he gets to indulge in cheesecakes and peanut butter fudge for dessert. Tonight for Valentine's Day, I am actually making homemade meatballs and sauce. The sauce is simmering on the stove now. I'm trying a new recipe, so I hope it's good. 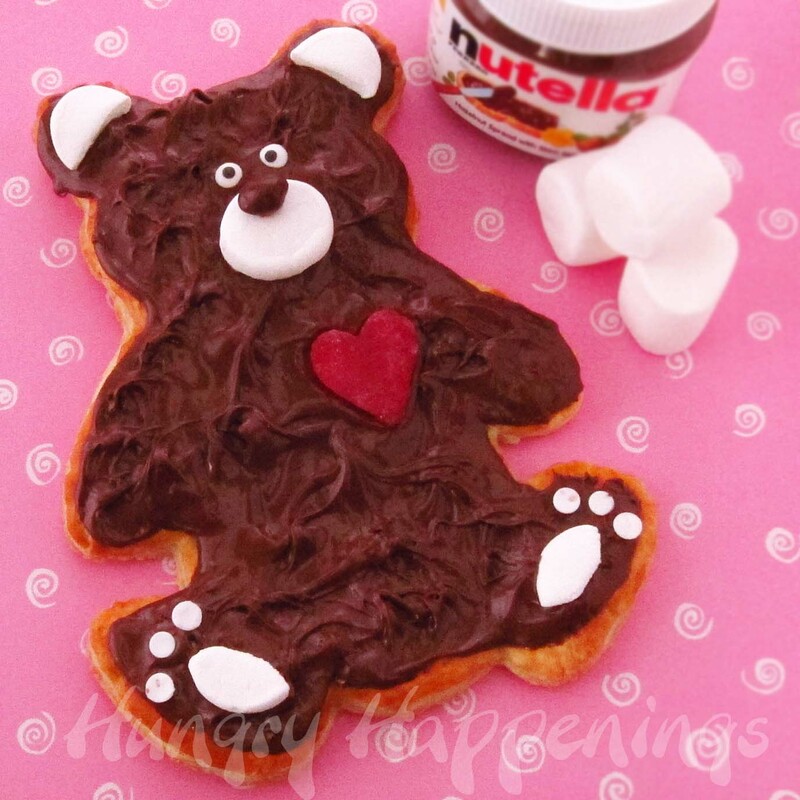 This is one way to make a personalised teddy bear ! I never thought of doing anything like this for my children, thank you for idea.